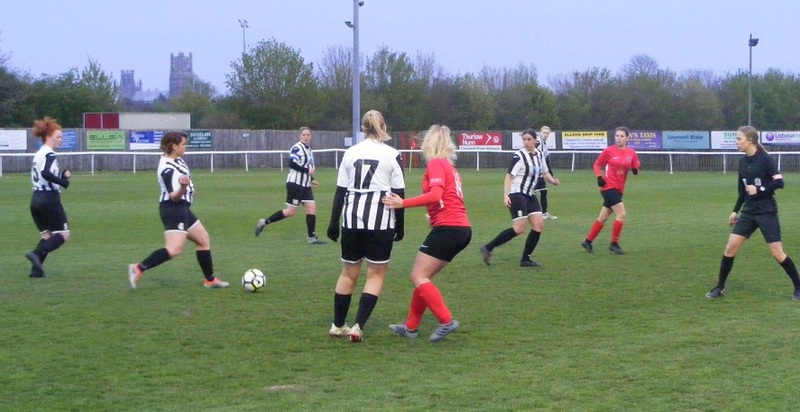 A trip to Cambridgeshire this evening for a Cup Final double, first up this Thursday the final of the Cambridgeshire Women’s Junior Invitation Cup, Cambridge City Ladies Development taking on Fulbourn Institute Bluebirds at Histon FC’s Glassworld Stadium. 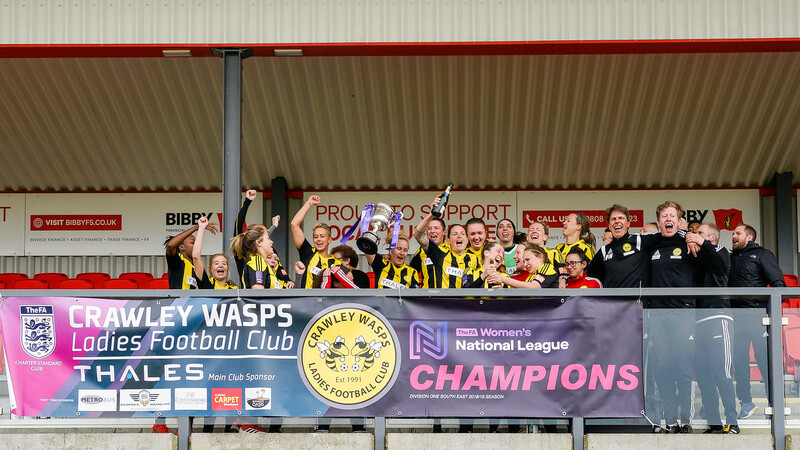 An all Cambridgeshire Women’s Premiership Final, Cambridge City Ladies Development with the chance to win a treble, beginning with a shot at silverware this evening have also reached this season’s League Cup Final to come in May. 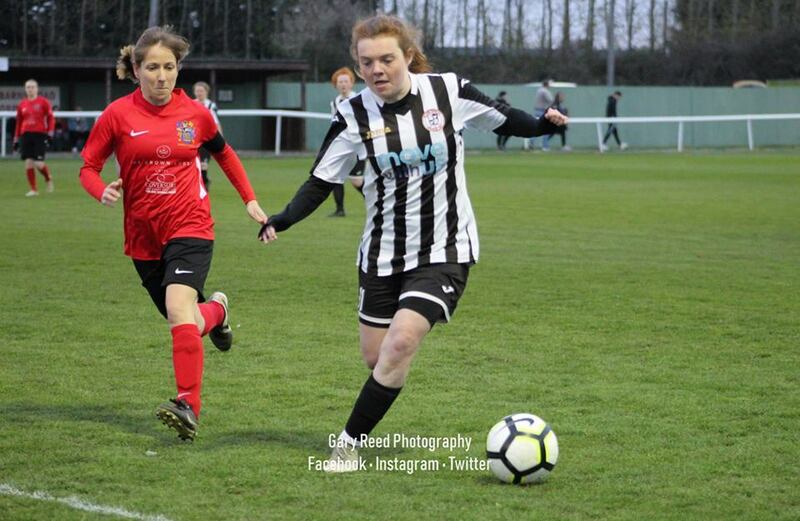 They are currently top of the league and in a strong position with 4 games left to play to win the title and with their 1st team winning the ERWFL Premier Division title this season their 3rd league title in 4 seasons the club is enjoying a prolific spell with a strong youth section being the bedrock of the club. 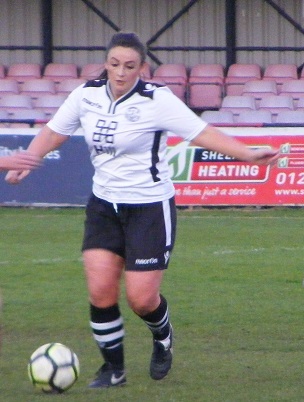 Megan Tonks top scorer for the Development side has 28 goals to her name so far this season. A Cup Final appearance for the second season running for Fulbourn Institute Bluebirds. 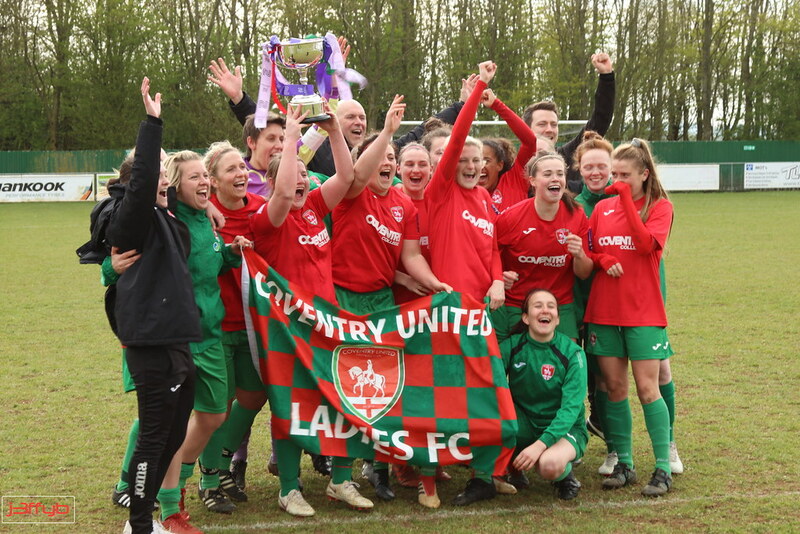 Reached the Cambridgeshire Women’s Division One Cup last season on their way to winning promotion back to the Premiership. Currently leading the pack in the cluster of sides below the top 3 with 3 points between the sides placed 4th to 7th a top half finish a real possibility with a handful of games left. 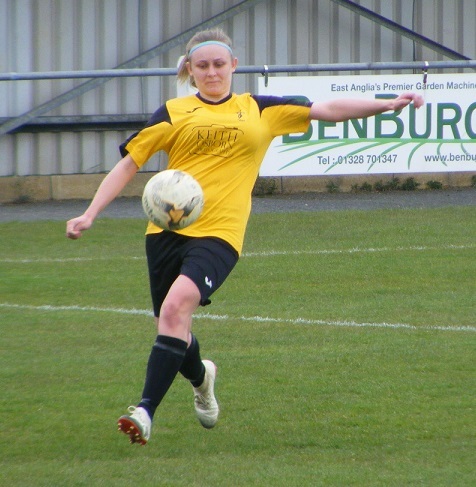 Marie Stubbings once again leading Fulbourn’s goal scoring charts with 17 goals to her name so far this season. Fulbourn receiving a bye in the 1st Round of the competition, Cambridge City awarded a home win the action moves on to the quarter finals. 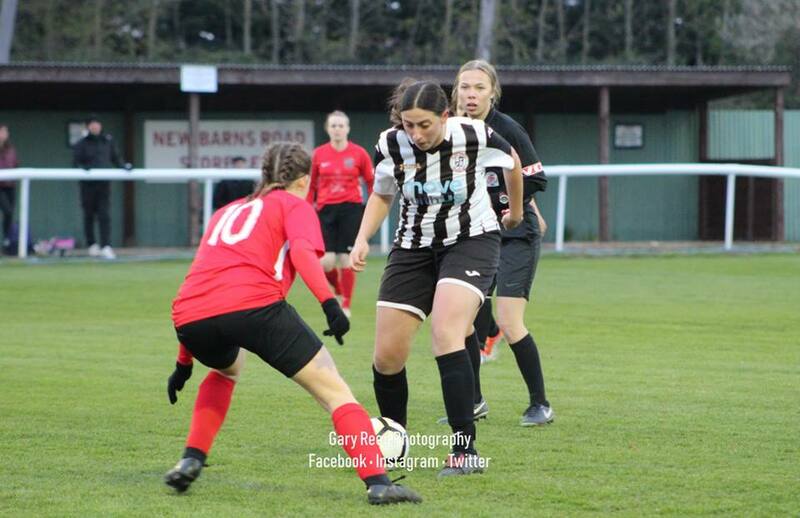 Cambridge City at home taking on Histon Ladies Reserves, Megan Tonks netting a hat-trick along with a goal for Hannah Lock seeing them win the game 4-1. 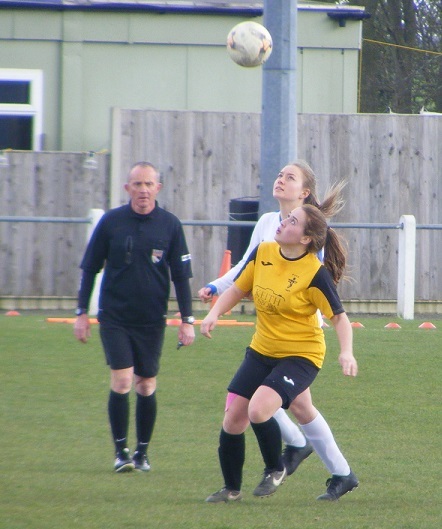 Fulbourn were at home too in the quarter finals taking on Championship South side Cambridge Ranger WFC, goals from Amy Smith, Yasmine Upson, Sharon Pinner & Marie Stubbings putting them through to the semi-finals with a 4-0 win. 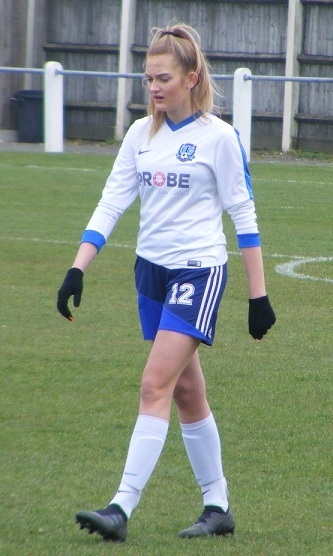 Onto the semi-finals Cambridge City at home to fellow Premiership side March Town United Ladies. Another hat-trick this time from 16-year-old Freya Standing, along with an own goal plus one from Rachel Pearce seeing them comfortably through to the junior Invitation Cup Final winning 5-0. 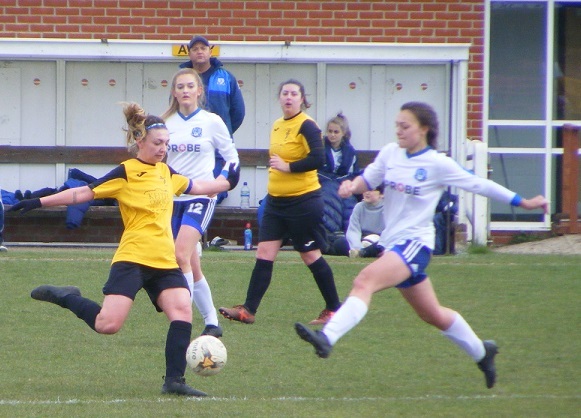 Fulbourn were taking on another Championship South side in the last 4, Burwell Tigers Ladies. A brace each from Stubbings & Pinner aswell as a goal by Katie Luddy securing a 5-1 win to send them through to the final. Histon FC’s Glassworld Stadium the venue for this evenings Junior Invitation Cup Final, it’s a large pitch offering plenty of width seen alot of action over the season. The bar open a large seated stand overlooking the pitch. The food hut open too, only went to get a cup of tea but the burgers did look good and temptation got the better of me, have been good though this believe it or not my first cheeseburger of the season and it was very nice too. The evenings pulling out the light not yet gone at kick-off a warm day beginning to cool, dry with a little cloud cover. 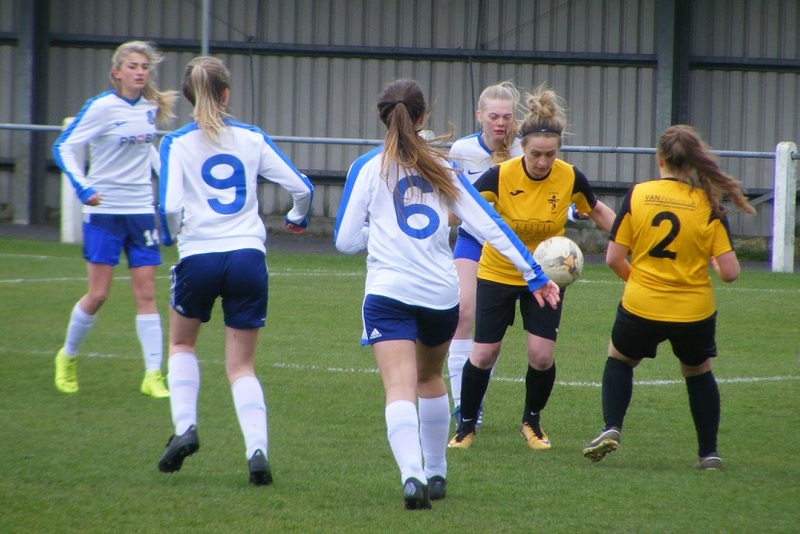 Cambridge City Ladies Development starting XI – Hannah Lock, Becky Langthorpe, Lucy Hurst, Anna Kanz, Jade Powell, Emily Reed, Rachel Pearce, Ellie Cullum (C), Yaz Crow, Freya Standing & Megan Tonks. 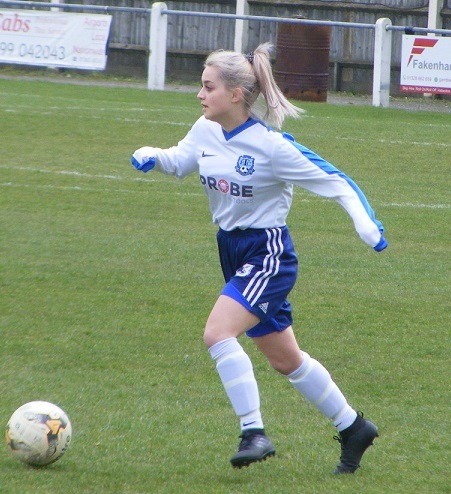 Subs – Jess Struthers, Amy Ozakpinar & Bronte Rapley. 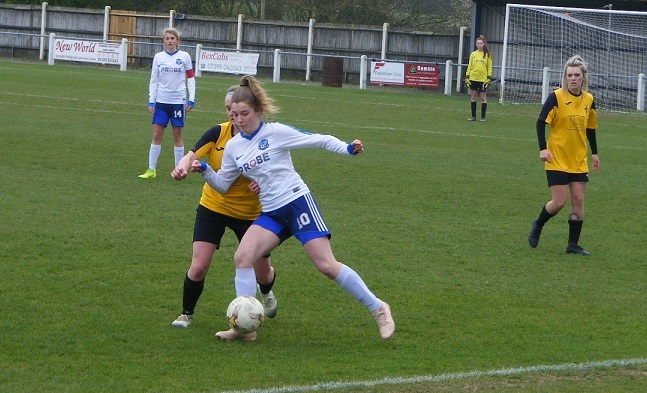 Fulbourn Institute Bluebirds starting XI – Samantha Isaacson (C), Seema Grewal, Krissie Taylor, Sarah Bodger, Abi Molloy, Katrina Cloherty, Emma Clark, Sarah Gee, Stacey Kemp, Sharon Pinner & Marie Stubbings. 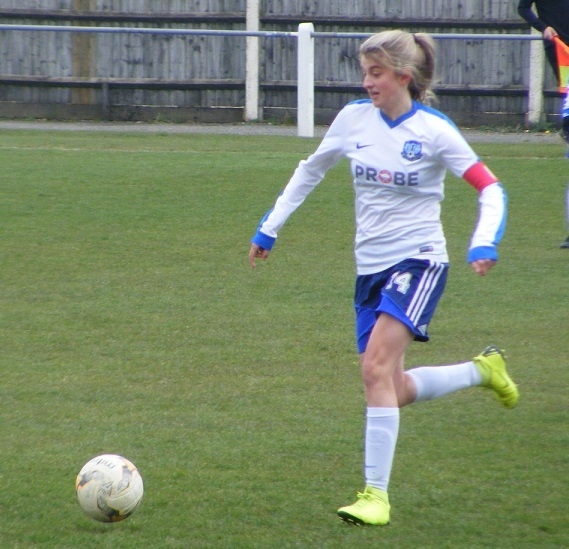 Subs – Amy Smith, Gabby Gallegos, Abi Dowell McGrillan, Nikki Cowan & Katie Luddy. It’s Fulbourn to get the Cambridgeshire Women’s Junior Invitation Cup underway wearing claret shirts and socks with navy blue shorts. Cambridge opposite wearing white shirts with black shorts and black and white hooped socks. 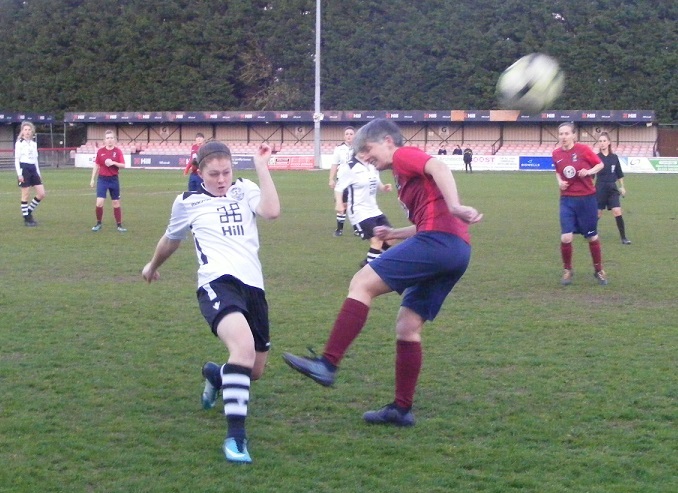 Cambridge closing down the ball in the middle quickly get position switch play down the right wing Freya Standing taking the ball on, Krissie Taylor defending for Fulbourn seeing the ball out for a goalkick. Fulbourn look to get away on their right the ball won on halfway Yaz Crow playing it on high into the area, Fulbourn’s Sarah Bodger getting her head on the ball nodding it behind for a corner. Played in from the left into bodies at the near post pushed out towards the top of the area met by a Cambridge shirt a low shot driven back in towards goal, Samantha Isaacson captain and goalkeeper getting down on her line to stop the ball. 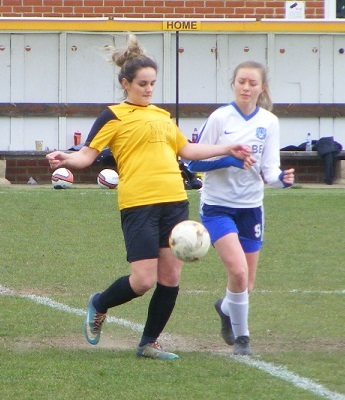 Cambridge captain Ellie Cullum looks to combine with Standing on the right as they press forwards Fulbourn defending Taylor backed up by Abi Molloy another corner conceded. Cambridge with a bright start closing the ball down. Standing attacks with the ball at her feet, Taylor up against her does well to nick the ball her clearance straight to Cullum her return ball back over the top for Standing sees her flagged offside. Standing seeing alot of the ball early on squares a cross to Cullum central 25 yards out she helps it on to the left Crow getting forwards takes the shot on early her strike racing wide across goal. Fulbourn riding out the early pressure from their opponents break forwards Bodger playing the ball out from the back long for Marie Stubbings to chase into the right channel she pushes it out of her feet before sending a low diagonal ball in towards the top of the area looking for Sharon Pinner who has gotten into an advanced position, pressures the Cambridge defence into a rushed clearance the ball straight to midfielder Sarah Gee she catches it well from 25 yards out the strike the shot over goalkeeper Hannah Lock smashes against the crossbar. 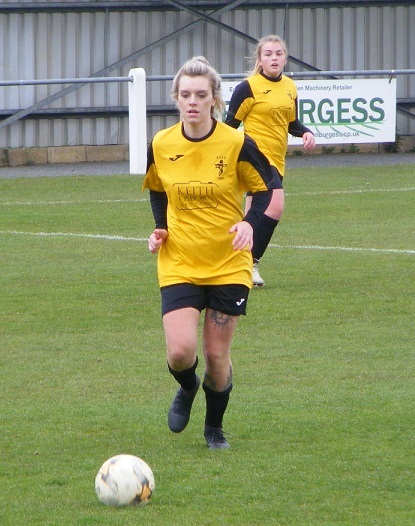 Cambridge get hold of the loose ball taking it forwards rapidly hitting Fulbourn on the counter the pass into striker Megan Tonks she is tackled 25 yards out the deflected ball running behind for a corner on the right. The delivery in near post Bodger is up well to defend for Fulbourn heading the ball on away past the far post a scramble for the ball sees it run wide of the post adjudged off a Cambridge foot a goalkick given. GOAL! 15 minutes on the clock and Fulbourn take the lead possession on the left the ball is played forwards a great pass finding Stubbings central 30 yards out back to goal turns well pushing on has Stacey Kemp making a fantastic run to her right lay the ball into her path the winger hitting the ball from outside the box well struck to whistle past the keeper into the back of the net and put see Fulbourn lead 0-1. Cambridge get straight on the attack a long distance strike from the right sent wide of goal, Seema Grewal defending at right back stops Crow taking the ball in behind. GOAL! Fulbourn’s lead doesn’t last long as Cambridge find an immediate response the ball kept on the left a throw in won inside the Fulbourn half players from both sides drifting across a pass slid forwards comes to Standing 20 yards out left of the D, not closed down takes a touch before taking on the shot the ball bouncing inside the six yard box managing to creep inside the post to see the scores level 1-1. More good footwork from Standing attacking right a cross swung in looping into the six yard box taken well by Issacson. Grewal on for Kemp on the right getting forwards has support from Stubbing central, Anna Kanz though doing well in defence for Cambridge winning the ball back and playing it forwards into Emily Reed, onto Cullum she turns attempting to play Tonks in behind, Bodger with an important interception for Fulbourn, Cullum latching onto the loose back her shot from distance falling wide of the target. 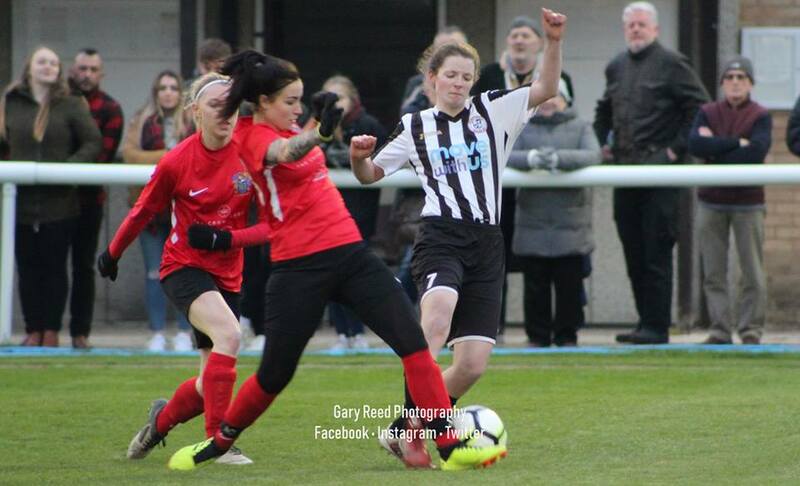 Rachel Pearce plays a fantastic diagonal pass forwards into Standing right side taking the ball on Taylor standing up against her well preventing her getting in behind. Fulbourn make ground on their right a throw in won level with the area, put on into Stubbings inside the box, Kanz tackling wins the ball. Cambridge make a change Hurst coming off at left back on in her place Jess Struthers. Good combination play between Standing and Tonks getting forwards attempting a one two the ball inside the box claimed well by Issacson down at the attackers feet. Play from one end to the other, Fulbourn winning a corner got work from Stubbings on the byline holding it up as Kemp plays it forwards. The delivery from the right defended at the near post Cambridge launching a counter attack, the ball out to the right Standing sending a cross racing into the area long cleared past the far post along the ground it met well by the advancing Cullum struck back in low cut out inside the six yard box the ball popping up for Tonks central has a stab at it placing the ball wide of the left post. GOAL! Cambridge come back from conceding the opening goal to take the lead a goal out of nothing possession high on the left the ball with Reed inside the area taking it to the byline not tackled looks for options corner of the six yard box, hooks a ball in towards goal the looping shot over Issacson drops over the line to see Cambridge go 2-1 up. A Cambridge corner on the right dealt well again at the near post by Bodger. Cambridge enjoying more of the ball exerting pressure towards the end of the 1st half make a 2nd change, Kanz the player coming off on comes Amy Ozakpinar. 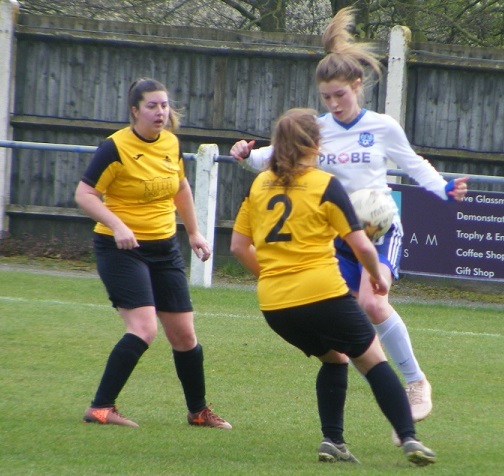 Fulbourn’s Emma Clark playing the ball forwards on the left for Pinner to chase, Becky Langthorpe’s clearance catching her in the face. A stinging blast hitting her in the eye, no chances taken time needed to recover, she is substituted one comes Abi Dowell McGrillan. 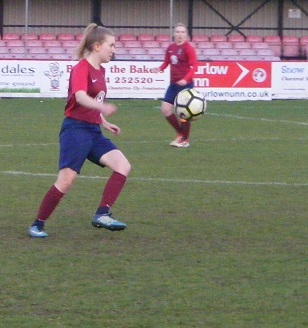 Stubbings seeing the ball into her feet 30 yards out looks to turn in behind Jade Powell getting in the tackle to regain possession. Good hold-up play from Clark on the left for Fulbourn inside the Cambridge half plays it back to Taylor before turning in behind to get forwards in attack the full back with a great past up to Stubbings outside the box cushions it down well aiming to put it on for Clark not quite able to take it in her stride, Struthers clearing for Cambridge. 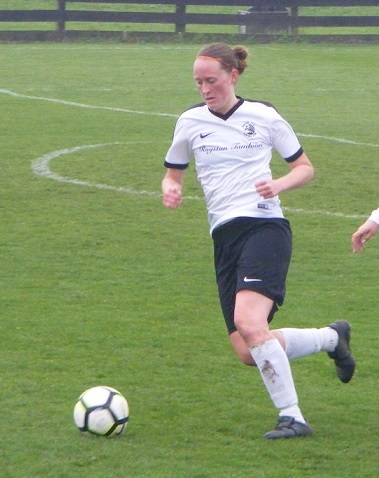 Katrina Cloherty with the ball central for Fulbourn out to Dowell McGrillan left her crossfield ball finding Kemp attacking on the right puts it into the area for Stubbing right of goal she gets a shot away the ball blocked deflected wide. 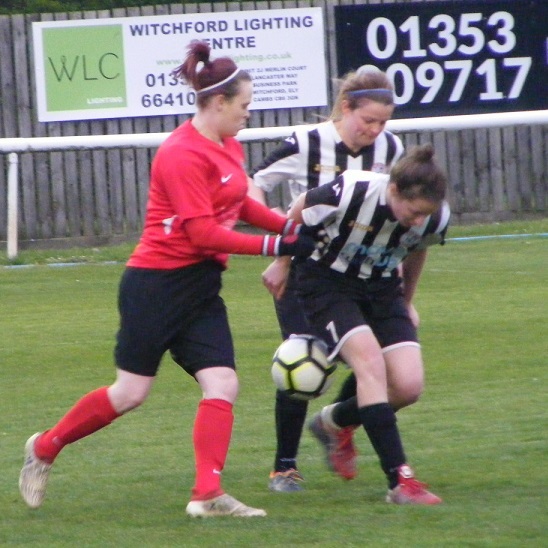 Kemp down with an injury after being fouled far side, a late change for Fulbourn, Amy Smith given her moment runs on the wind taken out of her sails as the whistle blows straight away for half-time. An entertaining first half Cambridge with the early pressure Fulbourn coping well in defence breaking well to open the first smash a shot against the ball then open the scoring from a well taken strike by Kemp. Switched off a little to see Cambridge draw level straight away and then go on to take the lead, not as fluid as Cambridge would like but the advantage is theirs at the half-time interval. Pinner back on for Fulbourn at the start of the 2nd half, no changes for Cambridge as they get the 2nd 45 minutes underway. Up in the stand to watch the 2nd half. 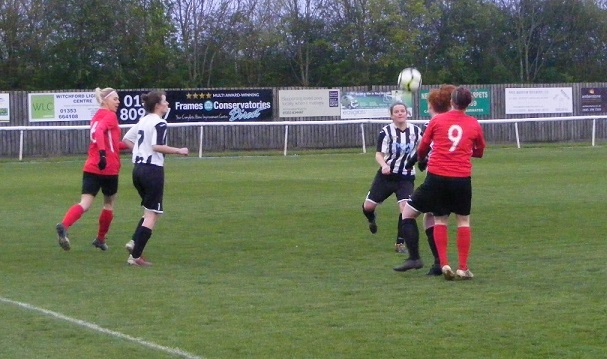 Pearce playing an over the top pass for Standing right side, Taylor getting across her and defending for Fulbourn. Standing with a strong run down the right again gets in behind this time bursting into the box hitting a shot goalwards, Issacson doing well at her near post down to push the ball wide across her six yard box, Grewal the first to it sends the clearance up field. Cambridge on the front foot attacking with purpose at the start of the 2nd half Crow taking the ball on to the byline left does well to get her side a corner. Taken short the angle opened to put in the cross, Grewal is out to the ball jumping to block the ball. 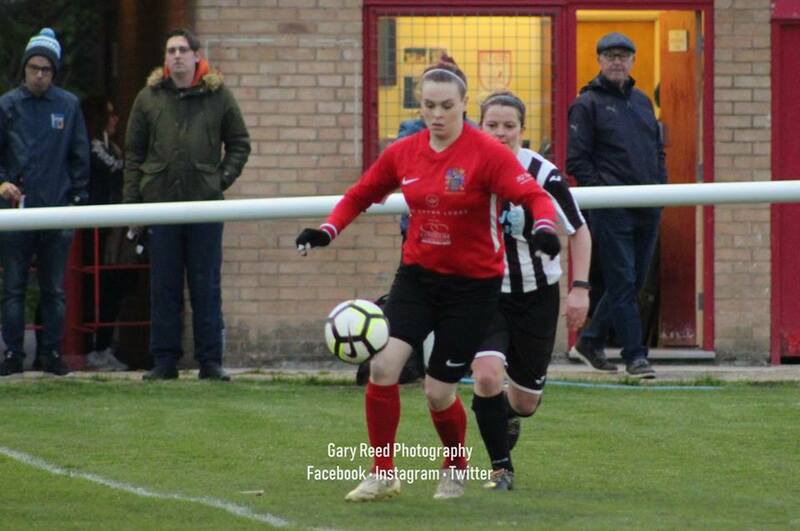 Standing with the ball right 30 yards out lays it back to Langthorpe the full back opening her boy to lift a long range diagonal pass into Tonks top of the D, chesting it down to her left tries to place it into the path of the advancing Pearce, the attack not quite coming off. Tonks coming left sends the ball on for Cullum breaking in behind, Grewal with an important interception. Cambridge all attack get forwards left a cross sent in along the top of the area Tonks looking to latch onto it, Molloy gets their just in time to block the ball deflected wide for a corner. In low from the left flicked on into the six yard box, a touch goalwards, straight at Issacson pops out of the keepers gloves a scramble for the loose ball ensues, but Issacson grounded has the ball in her gloves on her goal line. Fulbourn make a change Pinner off on comes Katie Luddy, little in the way of attacks so far Cambridge on the front foot. Standing pulled back on the right corner a free-kick awarded, the ball played into the near post, Bodger continues to win it for Fulbourn. Cambridge make a double change Reed and Tonks the players off on come Bronte Rapley with Kanz returning to the action.. Crow away on the left sending the ball inside for Cullum bursting into the box a snap shot not caught cleanly the midfielder snatching it wide of her near post. GOAL! Against the run of play Fulbourn break and get themselves back on level terms 20 minutes into the 2nd half. A fantastic run with the ball from Luddy on the right getting in behind to fire a cross into the box along the top of the six yard box knocked away at the near post the ball collected by Stubbings central just inside the area a great turn and hit the ball swerving past Lock curling into the back of the net 2-2 game on. A goal can do wonders for confidence and suddenly Fulbourn are on the front foot themselves looking to attack once more Grewal winning the ball back higher up the pitch pushing it on for Luddy, Struthers tackling to prevent the cross. The Cambridge defence put under pressure Powell clearing. Cambridge make another double switch Reed and Hurst returning in place of Cullum and Langthorpe. Standing drifting over to the left picking up the ball turns well inside the box her shot blocked, a 2nd bite at the cherry for Standing knocked central a shot pushed towards goal Issacson down to push it behind for a corner. An injury for Cambridge before it can be taken, Crow can’t continue Tonks is back on. Mayhem from the corner but I’ll do my best the delivery perfect in central top of the six yard box a header downwards cleared off the line put out to the right wide of goal a shot blasted back in smashes against the crossbar dropping into the six yard box players dive in referee Dulcie Asher pointing to the spot Cambridge winning the penalty! GOAL! Bronte Rapley placing the ball down a short run up and composed finish, Issacson going the wrong way as she finds the bottom left corner to restore the lead 3-2 with a little under 15 minutes to play. Luddy showing her frustration as she is adjudged to have fouled Struthers after Stubbings plays her in on the right with a good lay off. 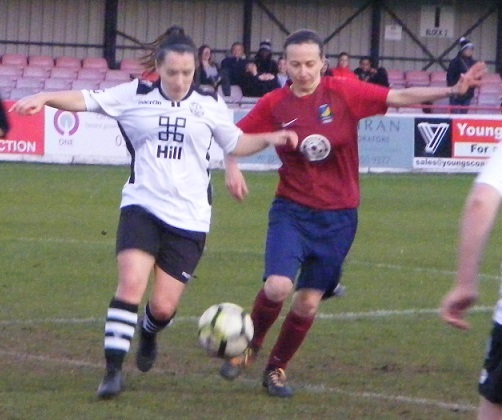 Standing on the left now gets clear to get her foot wrapped around the ball a drive a cross in across the six yard box, Molloy able to intercept and clear at the far post. Reed with a run from midfield the cross from the byline from Standing just evading her. Fulbourn making 3 changes in quick succession, Luddy first for Cloherty, Pinner return in in place of Gee with Gabby Gallegos for Pinner whose cameo was longer than this paragraph suggests. Fulbourn win a free-kick in a dangerous area just in front of the D, Taylor over it gets her shot in on target past the wall, safely gathered by Lock back on her line, Time running out Cambridge are a young side and they don’t tend to run the ball into the corners attack on their minds. Bodger well placed tracking back to intercept with Tonks on her shoulder as Struthers threads a diagonal ball into her the ball out for a throw on the left. 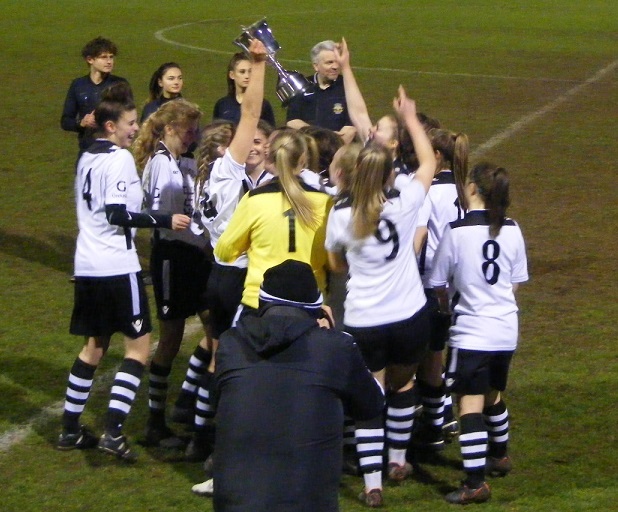 Time up the final whistle blows and Cambridge City Ladies Development celebrate winning the Junior Invitation Cup. The first part of their potential treble complete, Cambridge weren’t at their best but that only added to the excitement. A strong start but Fulbourn rode it out well hitting on the counter taking an early lead. Their back four playing really well all making some crucial tackles and breaking up Cambridge’s flow. Switched off for both the goals as Cambridge fought back to level straight away then take the lead. An onslaught at the start of the 2nd half from Cambridge without getting the break through of a 3rd goal. Fulbourn taking their chance well through Stubbings to make it 2-2. Cambridge getting the opportunity to restore their lead from the penalty spot Rapley with a composed finish. 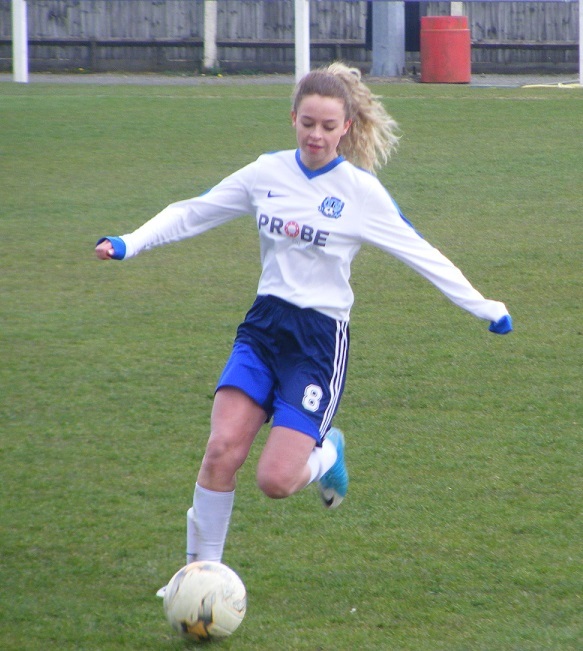 On to this evenings Women’s Football East – Player of the Match. An entertaining game with some great moments of defending two well taken strikes from Fulbourn, the award goes to the scorer of Cambridge’s first goal Freya Standing easy to see why she has broken into the first team this season, lively on the wing always available as the ball is won back at the back taking players on and setting up attacks. 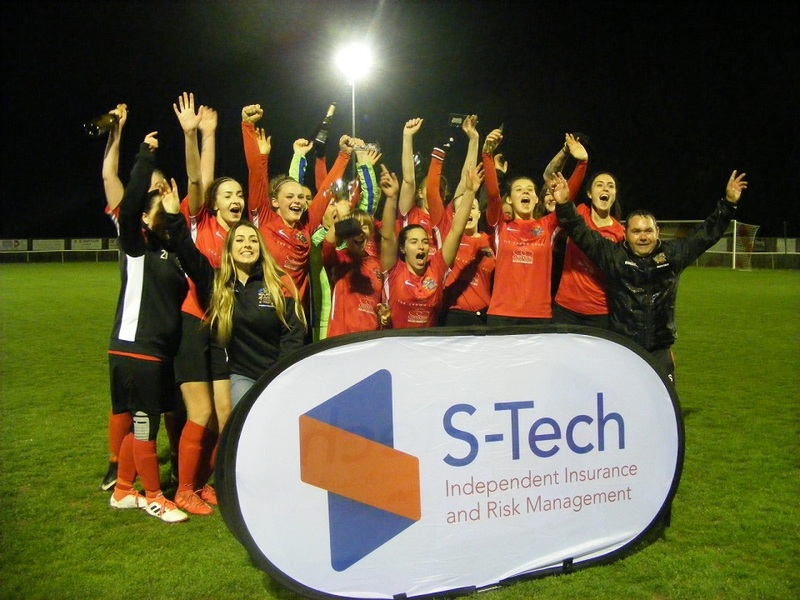 Congratulations to Cambridge City Ladies Development on their trophy success this evening. 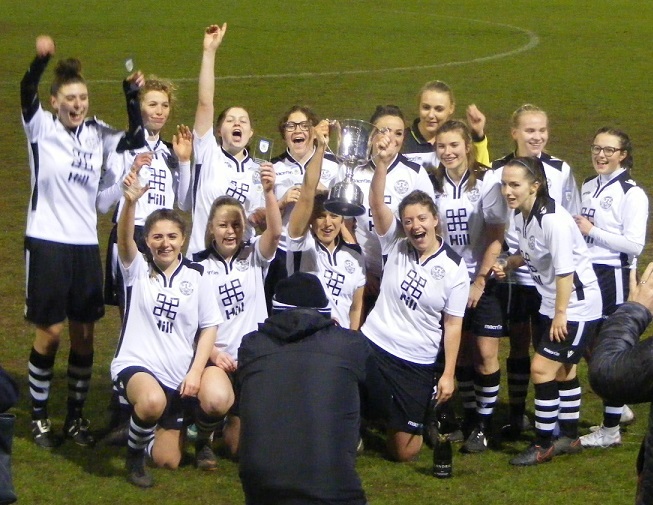 Cambridgeshire Women’s Junior Invitation Cup Winners, Cambridge City Ladies Development. 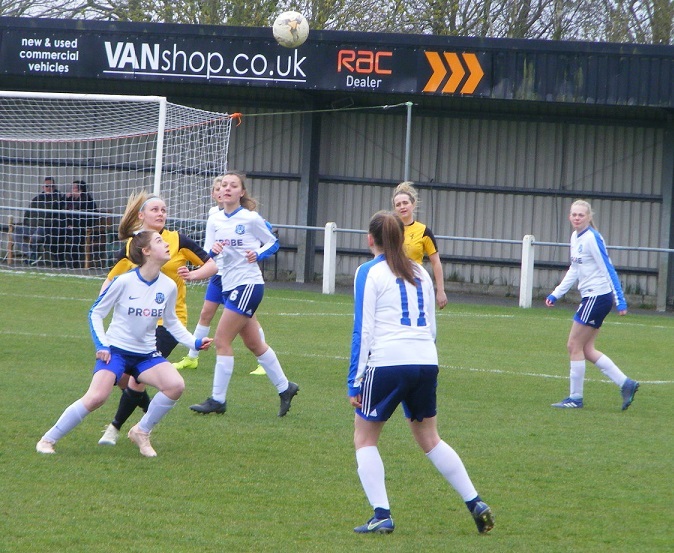 One final down, back to Cambridgeshire again tomorrow (well it’s today as I write this) for the Division One Cup Final, St Ives Town Ladies Development up against Wisbech Town Ladies at Ely City FC. An enjoyable game under the lights at Histon, my thanks to both sides for the team details. 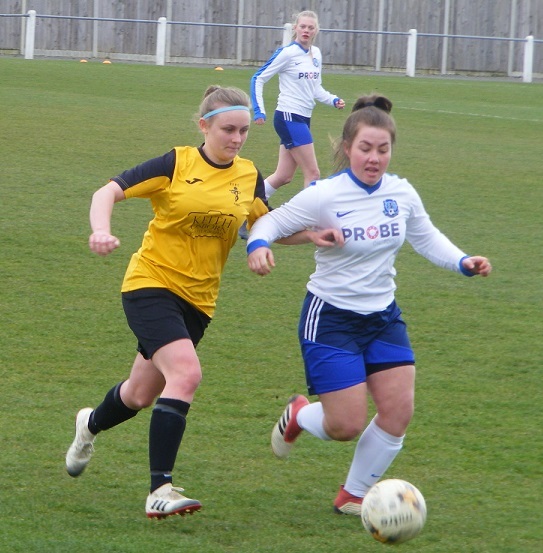 This entry was posted in Cambridgeshire Women's Junior Invitation Cup, Cup Final, Match Reports and tagged Cambridge City Ladies Development, Cambridgeshire Women's Junior Invitation Cup, Cup Final, Fulbourn Institute Bluebirds, Match Report on April 12, 2019 by WFEast.